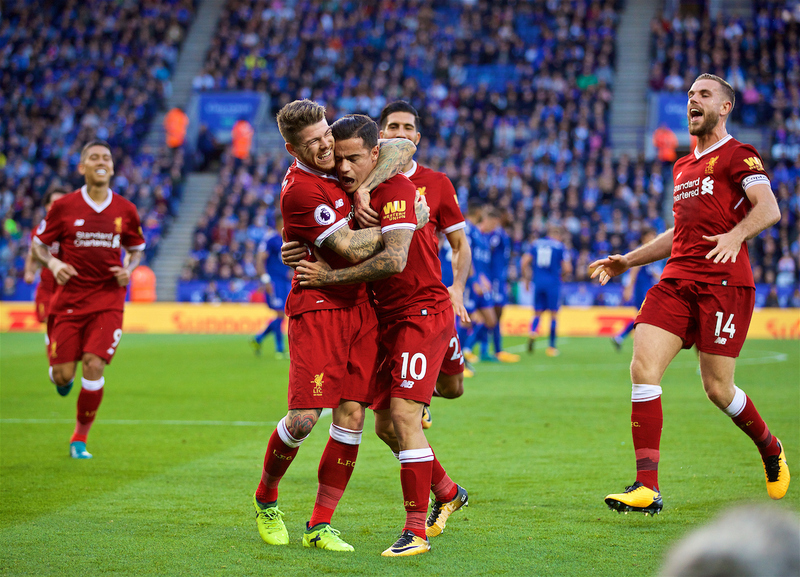 Liverpool edged out Leicester City 3-2 to claim a first win in four matches in a thrilling game at the King Power Stadium. 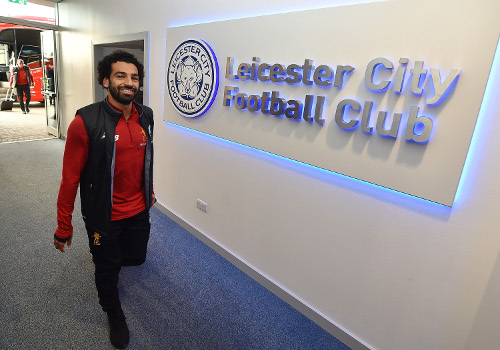 The manager offered his reaction to Liverpool's 3-2 victory over Leicester City in his post-match press conference at the King Power Stadium. 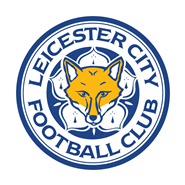 The Reds end a four-match unbeaten run by claiming a 3-2 victory over Leicester City at the King Power Stadium. 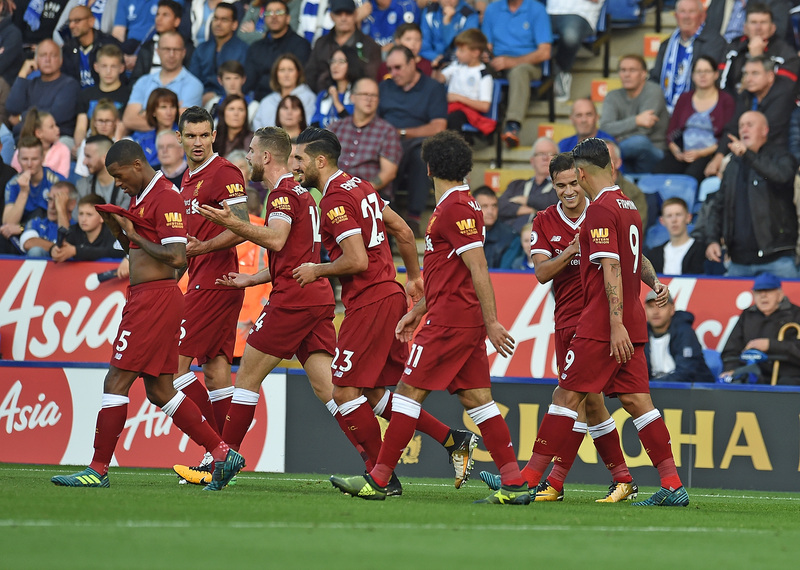 Jürgen Klopp's side raced into a two-goal lead thanks to Mohamed Salah's header and a magnificent free-kick from Philippe Coutinho before Leicester pulled one back through Shinji Okazaki. Jordan Henderson extended Liverpool's lead before Jamie Vardy reduced the deficit. The Foxes' forward then had a penalty saved by Simon Mignolet as the visitors claimed the win. Vardy goes into the book after a late challenge on Moreno. Oxlade-Chamberlain breaks into space in the box and pulls it back for Wijnaldum, who side-foots well wide of the far post. Sturridge has another go from the edge of the area. This time Schmeichel beats it away at full stretch. Change for the hosts - Albrighton off, Slimani on. Oxlade-Chamberlain comes on for Coutinho. Sturridge shifts into space on the edge of the area and clips inches over the crossbar. Unlucky. Liverpool change: Milner on, Can off. Leicester change: Iheanacho on, Okazaki off. The goalkeeper beats away Vardy's blast and keeps Liverpool's lead intact! Mignolet brings down Vardy and the hosts have a spot kick. And Leicester are right back in this as Mignolet's save from Gray's volley lands on the head of Vardy yards out and he nods in. Liverpool extend their lead as they stop a Leicester attack and get forward at speed. Sturridge holds play up before squaring for Henderson, who steps inside Morgan and finds the net with a reserve shot into the corner. Coutinho picks out Salah inside the area, but his shot is blocked by a defender. Liverpool work it forward again and Moreno finds the No.11 with a pull back, but again a defender gets in the way. Now Liverpool make a change with Sturridge taking the place of Firmino. Leicester make a change as Mahrez goes off and is replaced by Gray. Firmino lines one up from distance...over the bar. Henderson sweeps in a cross towards the back post where Can meets it, but gets under the ball and heads high over the bar. Lovren goes to ground under the attentions of Maguire as he tries to attack a corner. The referee waves play on before stopping to book the Liverpool defender for his appeals. Leicester applying the pressure in these early second-half exchanges. Coutinho side-foots a half-volley towards goal from just inside the box after Can's header looped the ball into the air, but it's a comfortable take for Schmeichel. We're back under way as Leicester re-start the game, in which Liverpool hold a 2-1 lead. Click here to place a bet with BetVictor. Shinji Okazaki's goal potentially changes the complexion of the game after Mohamed Salah and Philippe Coutinho had fired Liverpool into a two-goal lead. Leicester are back in it as Okazaki scrambles the ball over the line following a corner. Liverpool aren't happy about something and are appealing to the officials, but the goal stands. 2-1 now. A brilliant one-handed stop from Mignolet keeps out Vardy's stooping header from Mahrez's free-kick. Matip is booked after he's adjudged to have tripped Vardy on the corner of the box. Liverpool go close to a third as Firmino pings the ball across the face of goal and Coutinho is close to turning it over the line on the slide at the back post. Okazaki has the ball in the back of the net for the hosts...but the flag is up. Chilwell drives a low ball into the six-yard box, but Mignolet claims ahead of Vardy. The Reds are well on top here. Coutinho's brilliant spin-and-pass sends Moreno bounding towards the Leicester box, but his drive is blocked by Simpson. From the resulting corner, Firmino heads straight at Schmeichel from 12 yards out. And it's 2-0 thanks to a magnificent free-kick from Philippe Coutinho. The No.10 steps up 25 yards out and curls it over the well and as far into the corner as possible away from the dive of Schmeichel. Ndidi now booked for a barge in the back on Moreno as he bombed forward. Liverpool almost gift Leicester an equaliser as Mignolet's attempted clearance outside of his area is charged down by Vardy. The ball breaks for Okazaki, who attempts to guide it into the empty net, but the Reds' 'keeper manages to get a touch to nudge it wide. Albrighton goes into the book for a late challenge on Salah. Salah attones for his miss just seconds earlier by heading Liverpool in front. Coutinho's inswinging cross to the back post from the left corner of the area is met by the forehead of our No.11 at a tight angle and Schmeichel is powerless to prevent it hitting the back of the net. 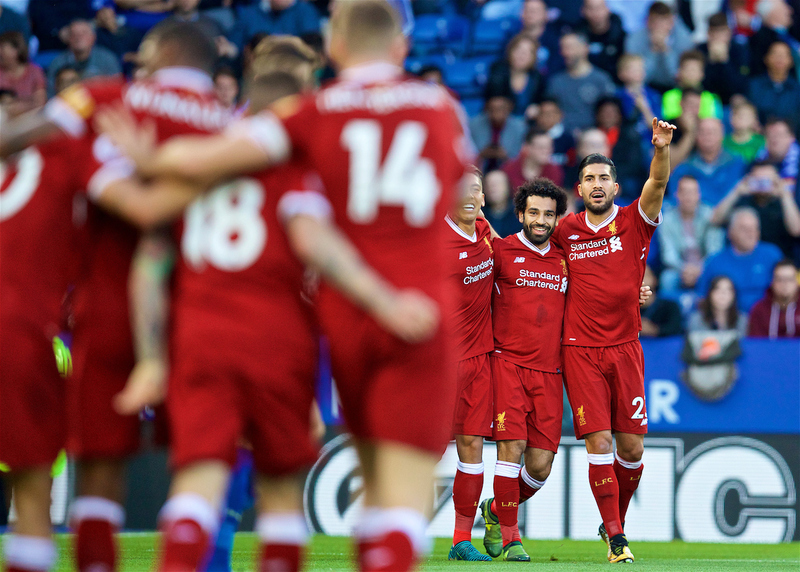 Liverpool spurn a glorious chance to open the scoring as Emre Can's 20 yard skimmer strikes the base of the post and falls for Mohamed Salah, but he sends his instant shot wide of the post when a goal appeared inevitable. A real let-off for Liverpool in the early exchanges as Okazaki's pass sends Vardy speeding into the area. His attempt to beat Mignolet from a tight angle is parried by the goalkeeper, but Mahrez almost nets the rebound as Lovren hesitates. Thankfully, he shoots over from six yards out. Can finds some space on the touchline inside the area after Liverpool broke forward, but his attempt to drive the ball into the centre is stopped by Schmeichel. We're under way at the King Power Stadium as Gini Wijnaldum kicks the game off. 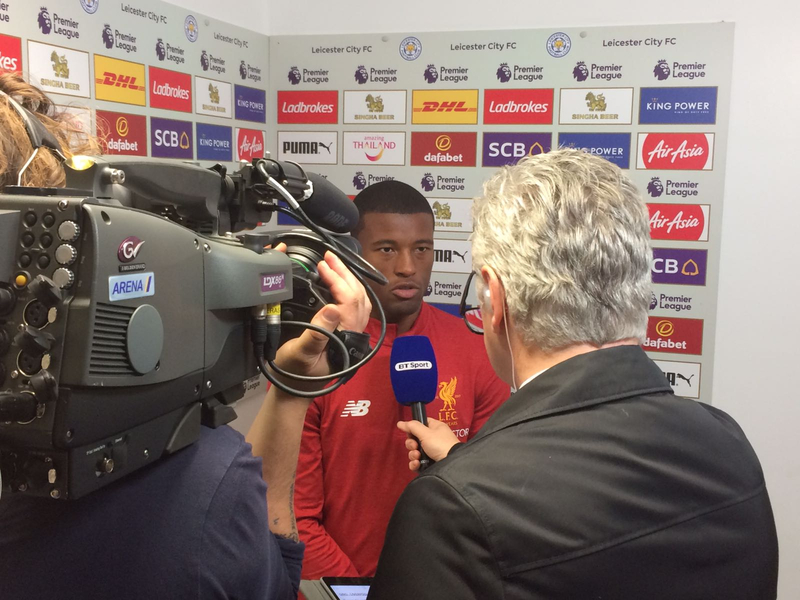 Wijnaldum faces the media ahead of kick off at the King Power Stadium. 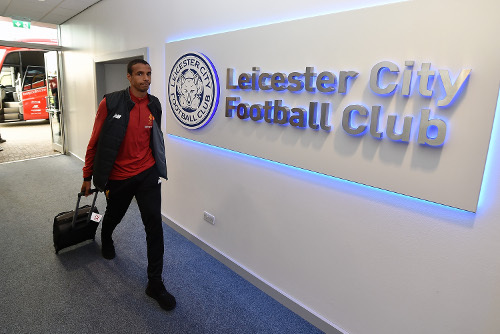 The lads arriving at the King Power Stadium a short while ago. 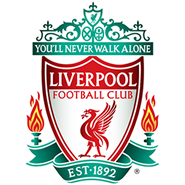 Liverpool: Mignolet, Gomez, Matip, Lovren, Moreno, Henderson, Can, Wijnaldum, Coutinho, Salah, Firmino. 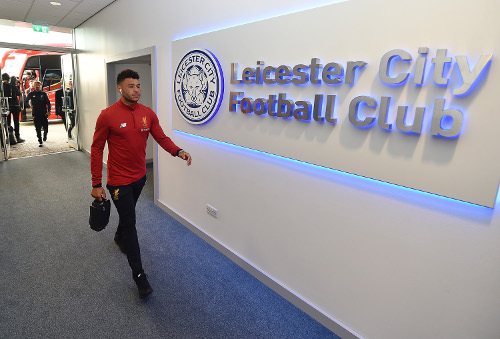 Subs: Karius, Milner, Sturridge, Klavan, Oxlade-Chamberlain, Solanke, Alexander-Arnold. 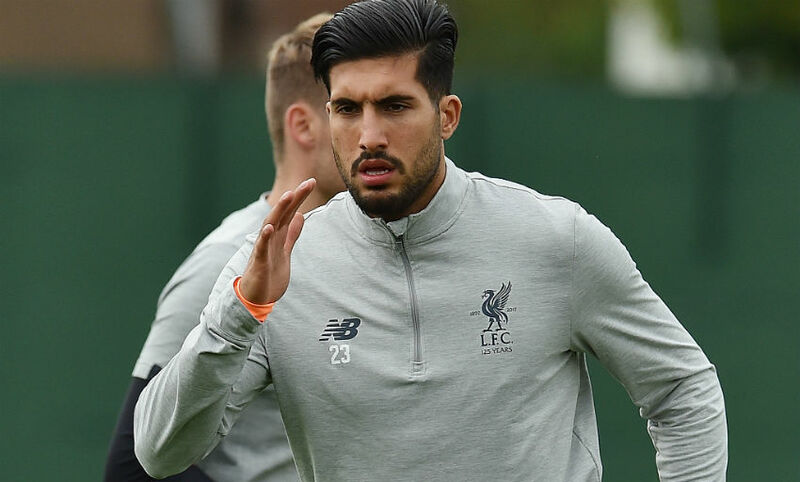 He writes: "Though the personnel may be different for both sides, we saw on Tuesday some of the threats Liverpool pose, particularly during that first half. It took us some time to adapt to managing those threats, but we'll need to have those lessons in mind from the off this evening. "There's no hiding that we led a bit of a charmed life during that first half on Tuesday night and I was actually delighted to get in at half-time with the game goalless. Sometimes it's about having the resilience and character to stay in a game." Fancy a flutter? Click here to bet with BetVictor. 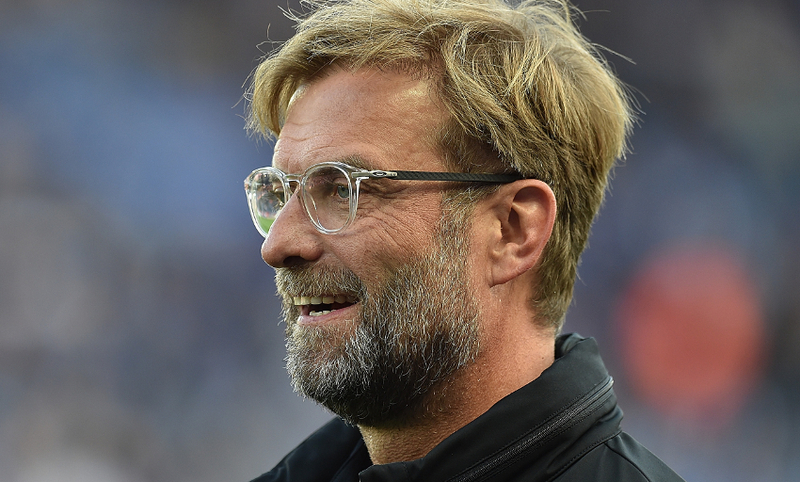 Read more from Jürgen Klopp on summer signing Mo Salah by clicking here. 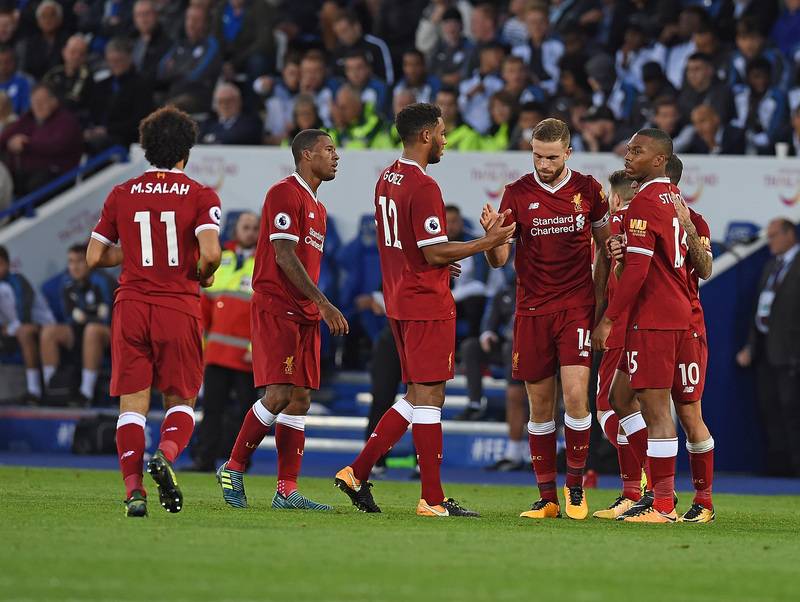 There have been only three goalless draws in 94 league clashes between Liverpool and the Foxes, with two coming at Leicester - in 1998 and 2004. More stats like that can be found here. "You have to take the positives. You have to keep trying and don’t think back to the games. You have to go again. Now we play against Leicester again; after three or four days, it’s great to play against a team where you lost." Liverpool's No.23 is looking forward to today's game it seems! Read more from his interview here. See how preparations for today's game went with our latest behind-the-scenes clip from Melwood below. Not signed up to LFCTV GO yet? Find out more here. In case you didn't know, the Reds first team are looking to make it four wins from four games across the club this weekend. The U18s, U23s and Ladies all tasted victory last night - let's hope Jürgen Klopp's charges can follow suit at the King Power Stadium. We're still over five hours away from having today's matchday squads confirmed, but what do we already know about who could line up for either team? Updates on Dejan Lovren, Joel Matip and Jamie Vardy all feature here. 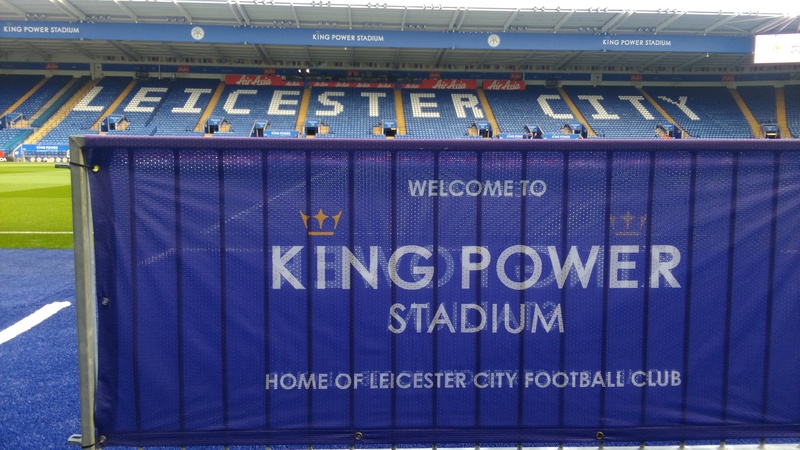 Hello and welcome to Liverpoolfc.com's live matchday blog for the Reds' Premier League trip to Leicester City. Revenge is on the agenda for the visitors today after their midweek defeat to the Foxes in the League Cup - stick with us for the best build-up to the match.